The television station is on the second level, above a city-owned garage. Parking costs in the garage are $3 ($5 during a special event) and quarters/bills are required for the gate-toll machine. Garage capacity is 550 cars. There are parking meters on 12 Street. 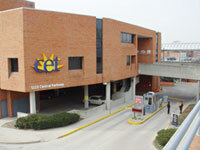 CET is located in the Crosley Telecommunications Center, on the southwest corner of Central Parkway and Ezzard Charles Drive, directly across Central Parkway from Music Hall and across Ezzard Charles from Cincinnati Police District One headquarters. From I-75: South on I-75, to the Ezzard Charles Drive exit (exit l-G). Turn left (east) and travel four traffic signals to Central Parkway (dead end). Turn right onto Central Parkway and immediately enter the garage. From I-71: South on I-71 to the Reading Road exit. At the second light (Liberty Street) turn right. Continue straight ahead (west) nine traffic signals to Central Parkway. Left (south) on Central Parkway to just past Ezzard Charles Drive and enter garage on the right. North on I-75, cross the Brent Spence Bridge. Follow the signs To I-75/Dayton and exit just past the bridge to the right at the River Road/50 West exit. Immediately traverse four lanes to the Linn Street/Dalton Avenue exit. Turn right (north) onto Linn. At the third traffic signal, turn right (east) onto Ezzard Charles Drive. Continue three traffic signals to Central Parkway and turn right. Immediately enter the city-owned garage. North on I-471, cross the Daniel Carter Beard Bridge. Exit Liberty Street. Continue straight ahead (west) onto Liberty and through nine traffic signals to Central Parkway. Left (south) on Central Parkway to just past Ezzard Charles Drive and enter the garage on the right. Columbia Parkway to Ft. Washington Way to I-75 north. Hug the right lane and exit Ezzard Charles/Liberty. Go right (east) four traffic lights on Ezzard Charles to Central Parkway. Right onto Central Parkway/garage. N I-71 to Ft- Washington Way. (Follow directions given above paragraph.) South on I-275 to 471 (in Northern Kentucky) to Liberty Street exit (in Cincinnati). Continue straight ahead (west) nine traffic signals to Central Parkway. Left (south) on Central Parkway to just past Ezzard Charles Drive and enter garage on the right. N I-74 to I-75 south. Exit Ezzard Charles Drive (exit l-G). Turn left (east) and travel four traffic signals to Central Parkway (dead end). Turn right onto Central Parkway/garage. N Hopple Street viaduct, Western Hills viaduct, or Ludlow viaduct: Right (south) on Central Parkway to Ezzard Charles Drive/garage. N Eighth Street viaduct to Central Avenue. Left (north) to Ezzard Charles Drive. Right (east) on Ezzard Charles to Central Parkway (dead end). Right on Central Parkway/garage.